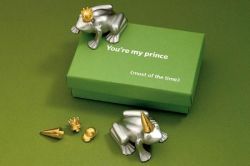 "You're my Prince (Most of the time)"
Comes with a gold plated crown, ball cap, and dunce cap. Move them around to suit your mood. Sometimes you're a prince. Sometimes your just hanging out and sometimes you're a dunce. Cast in pewter. Measures approximately 2" in diameter. Gift boxed. Proudly made in the USA.